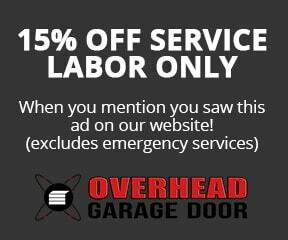 Winter Garage Door Issues - Overhead Garage Door, Inc.
7 Serious Garage Door Issues in Winter (And How to Prevent Them)! Your garage is a great convenience in the winter months. It not only protects your vehicle from the weather but also provides you easy access to your vehicle on cold, icy, or snowy days. But, garage door issues can impact this convenience and even cause other, more severe inconveniences. You could get stuck inside the garage when you need to be somewhere. Or worse yet, stuck in the cold when you’re trying to get back in. Winter is the most common time of year for garage door problems, and perhaps the most annoying. That’s why we’re here to discuss what you can do to prevent these issues. Problems with your garage door are not only inconvenient and annoying but can also be expensive. A stuck garage door in the open position can have negative impacts on your energy bills. Not to mention storm damage that could occur. It also leaves everything in the garage at risk of being stolen. It’s important to understand what could go wrong with your garage door any time of year. This way, you can perform the proper maintenance to help prevent these issues. If your garage door is getting stuck, it’s most likely a lubrication issue. This is a simple fix that you can do at home on your own. You’ll need to wear the proper gloves in order to avoid cutting yourself on the sharp metal tracking. Keep in mind that the lubrication may be messy. You can lay newspaper or cardboard on the ground for easy cleanup. If your garage door is not opening at all, it could be an indication of worn or broken springs. These springs are designed to offer counterweight on your garage door so that it doesn’t feel so heavy. It’s very important to note that you should never attempt to repair or replace garage door springs on your own. This is a job that should be left to a professional that has been trained to do it safely and properly. Before you diagnose the problem as your springs, however, try opening the garage door manually. If it opens easily, it could simply be your garage door motor. Unfortunately, this is another garage door repair that requires a professional. The good news is, just because your motor isn’t working doesn’t mean it needs to be replaced. Your technician may be able to make minor adjustments that will have you back up and running in no time. A quite more serious issue that you may experience with your garage door in the winter months is contracting metal. Even if you have a wooden garage door, many of the components are constructed of metals. Metal shrinks in cold weather creating tension and preventing movement. If your garage door experiences a rapid freeze, it could also cause your garage door track to bend which will require repairs. The best defense against this issue is proper and regular lubrication and maintenance. Garage doors with multiple panels are more prone to moisture getting caught between, which can freeze in the winter. In turn, it also causes your garage door to lock up. You can easily identify this issue with a quick visual. If you notice ice in the panels, simply use a hair dryer on the average setting to melt it. Make sure to clean up any excess moisture to prevent it from freezing up again. Weather stripping isn’t necessarily going to cause a problem for you to open or close your garage door. But, it will have an impact on your energy bills. This is a simple fix that you can do yourself. Although, it’s recommended to call a professional so that you may ensure the seal is tight and secure. Of course, before you begin troubleshooting, it’s always a good idea to double check your garage door opener batteries. It may seem like a silly or minor fix, but it could very likely be your only problem, saving time, headache, and money. If you want to keep your garage door running like new all year through, there are a few simple tasks to complete every few months. Follow these steps at the start of each season to prevent future issues. Regularly wiping and brushing the lifting mechanisms on your garage door will help prevent the build-up of dirt and grime. If you haven’t done this in a while, you may need a bristle brush and a generous amount of solvent to get it clean. While you probably remembered to lubricate the tracks and rollers on your garage door, oftentimes, homeowners forget about the pulley system itself. Simply apply generous amounts of the lubricant to the pulley lines and allow them to cycle through the enclosed casing. The lubricated lines will help to lubricate the inner workings of the device. Besides cleaning with solvent, you can also apply it to your tracks and mechanisms throughout the year. This will help prevent dirt and grime from building up in the first place. Solving your garage door issues in the winter can be frustrating. Keep these tips in mind throughout the year so that you can be best prepared for the inclement weather. It’s better to address serious problems in the summer and fall to prevent getting left out in the cold. Also, remember that garage door repairs should always be left to a professional. Garage doors are heavy with a lot of intricate parts that can seriously harm you. And, you should always have your garage door serviced annually, even if you’re already performing preventative maintenance – a professional can detect damages before they occur. If you’re looking for just such service, don’t hesitate to contact us. We have been serving the Chicagoland area for nearly forty years.